El antitanque Marder II se utilizó en todos los frentes desde 1942 hasta el final de la Segunda Guerra Mundial, con 576 vehículos construidos entre junio de 1942 y junio de 1943, además de 75 reconstruidos a partir del chasis de PzKpfw II en 1944. 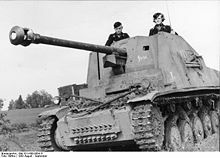 The Marder II is a German Tier III Tank Destroyer. 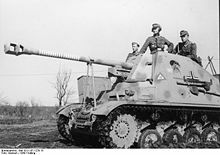 The Marder II was developed in response to Germany's first encounters with the T-34 and KV tanks that the Soviet Union fielded in the early stages of the German invasion of Russia. 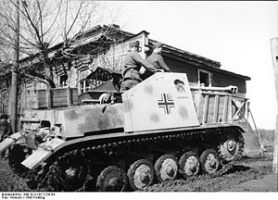 The Marder II was converted from existing Panzer II chassis, with a total of 852 produced between early 1942 and early 1944. Boasting great penetration and damage with it's guns at the expense of armor and accuracy, the Marder II can be a devastating force if it's strengths can be exploited and weaknesses minimized. With stronger engines and a more damaging top gun than the Panzerjäger I, the Marder II is a decent tank to play whilst heading further up the tank destroyer line. The Marder II leads to the Tier IV Hetzer. It is ill-advised to engage in close quarters as its low HP, poor armor, poor track traverse, and horrible movement accuracy will often result in a quick death. Keep in mind that the tank's open-top crew compartment has virtually no armor, making it extremely vulnerable to howitzers, High Explosive shells, autocannons and semi-automatic cannons. The key to playing the Marder II effectively is to remain hidden and behind the main lines, being patient and working with the horrible Aim Time and reticle bloom of the guns. Get behind bushes and let the multitude of quick Light and Medium tanks in this tier range, do the spotting for you. Exposure is tantamount to death, as you have neither the speed and mobility, nor the armor and HP to escape relatively unscathed from enemy fire. To maximize your performance in the tank, the Camouflage Net, Binocular Telescope, and Gun Laying Drive (GLD) Equipment will greatly help you in keeping hidden, allowing you to see far, and helping with the horrible Aim Time.